First of all I apologize for not posting the baked mac n cheese as I've promised. Things are not going good on my side, again my son has caught infection and the entire thing has started all over again. To top that, now my H has also fallen sick..ahhhh. 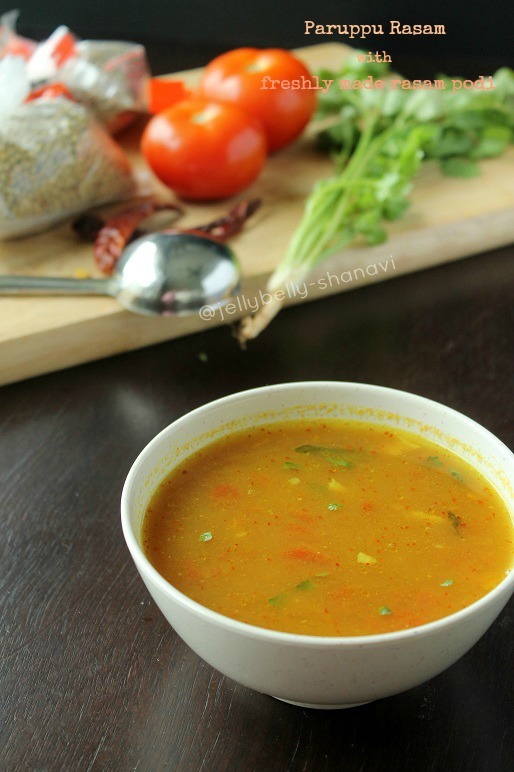 Coming to the issue, I find it difficult to write a long post with my current status also I've prepared this rasam for our lunch today, so it's kinda easy for me to pen down this simple one, but am keeping in mind to post the already promised recipe soon. Dry red chillies -- 2 to 3 nos. Pressure cook the thuvar dal with turmeric powder using 1/4 cup of water up to 3 whistles and make it ready. Grind the coriander seeds, thuvar dal, peppercorns, cumin seeds and dry red chillies to a fine powder and reserve for later use. Soak the tamarind in the water for half an hour and squeeze the pulp. U may add the water and the tamarind together and microwave it for a minute instead of the soaking part so that u may save some time. Crush the garlic and make it ready. Filter the tamarind and boil the tamarind water for 3 to minutes. In the meantime, squeeze the tomatoes using ur hand and collect in a bowl, add the rasam podi, hing, chopped coriander leaves and the crushed garlic . Mix well and add this mixture to the boiling tamarind water and add 2 cups of water and combine well. Add salt at this stage and cook them just until it comes to a foam. Heat the ghee with a tsp of ghee and do the seasoning with mustard seeds. Add the thuvar dhal and fry until it turns slighly golden and finally add the curry leaves. Add the seasoning mixture to the rasam and mix well. Make sure u don't cook/ bring the rasam to boil ,just cook until the foam tops it. Switch off and serve. U may also channa dal (roasted,1/4 tsp) while grinding and add to the masala. 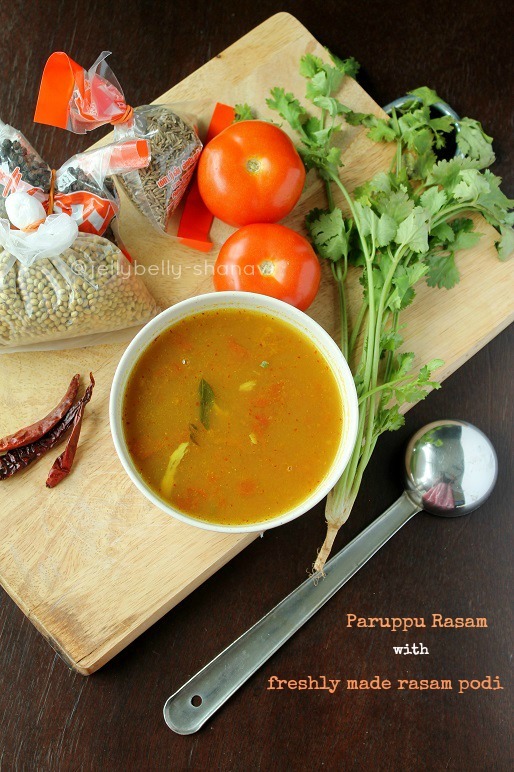 Rasam is my most favourite dish , I can have this anytime of the day.. Looks very tempting.. Sorry to hear about your son. Hope he is feeling better now. I can understand why sometimes its difficult to find time for blogging because I go through the same. 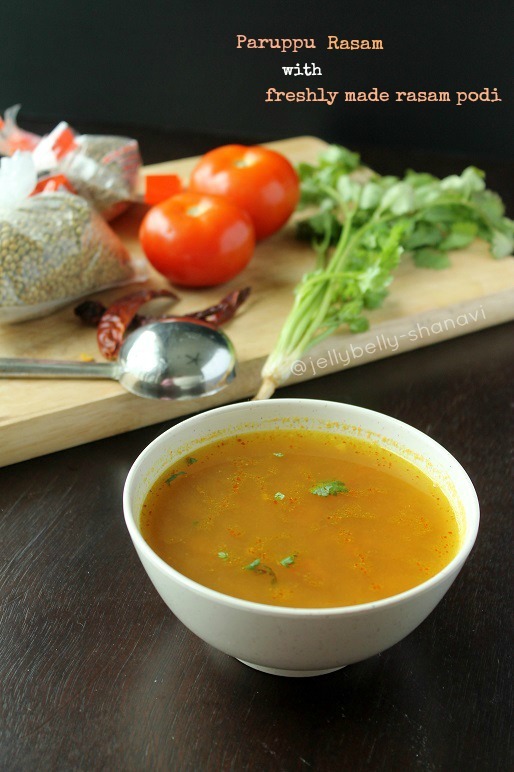 This rasam is on top of our list of food we adore and never get bored over. Stunning visuals to support an amazing recipe. My comforting food, can survive for many day with it.Be strong dear, my prayers are with u..
Hope your prince is getting better, Love this parippu rasam. Sorry abt the family health :( But the bowl of rasam is looking so good, that I feel like grabbing a spoon and help myself some of it.. And very glad to b ur new follower..